The relation between translation and Gender Studies has long been the object of academic attention (Federici et al. 2011; Nissen 2002; Von Flotow 2011). However, this coalition rarely constitutes the object of study from a translation perspective. The aims of our research were to raise awareness on gender issues among third-year students of a Spanish Language and Literature Degree and to foster a critical perception of translation. A three-phase methodology was designed with a pre- and post-test translation activity. Results show that this methodology helped students develop a critical translation process when gender issues are implied. 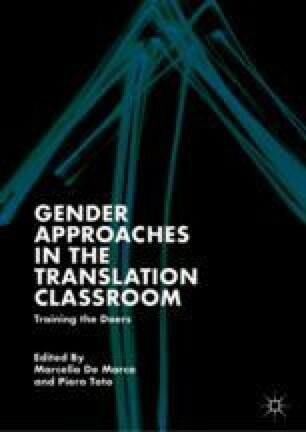 We conclude that an integrated approach in the training of translators with the inclusion of a gender perspective should be increasingly encouraged in academic settings. The introductory class on gender made me reflect and/or deepen my knowledge on some aspects that I had not previously thought of. After the introductory class on gender, my sensibility towards the text to be translated has increased. Contextualizing the author and her work before translating the text facilitates the translation process. The intention of the author when writing the text must be considered when translating it. A good translation must be impartial and accurate, regardless of the author’s subjectivity. I have translated the selected text with a gender perspective. The story contains politically incorrect elements that I did not translate literally, but I have neutralized their meaning. My translation into Spanish conveys the author’s intention in the source language. In my translation I have adapted some elements of the source text to the Spanish context. After completing the translation of this story, my general perception of traditional stories has changed. Donoghue, E. 2011. What Is a Canadian “Modern Family?” Interview with Emma Donoghue. NTO. Available at https://www.youtube.com/watch?v=e8Pr78Sr4cw. 16 October 2017. Donoghue, E. 2017. Good Reads. Q&A with Emma Donoghue. Available at https://www.goodreads.com/topic/show/508877-gender-and-violence. 16 October 2017. Nissen, U.K. 2002. Aspects of Translating Gender. Linguistik Online 11 (2): 25–37. https://doi.org/10.13092/lo.11.914.